And so a turnaround season came to an end Sunday night. I’m not sure I’ve even been around such a thud of an ending — in this case, the 5-0 Game 6 loss to the Predators at home that ended the Western Conference first round series — that was greeted so philosophically, accepted for what it was, even cheered as the final seconds wound down. The picture was bigger than Game 6. This was progress, monumental and surprising progress, after one of the most dreadful full-season performances in the modern NHL era. 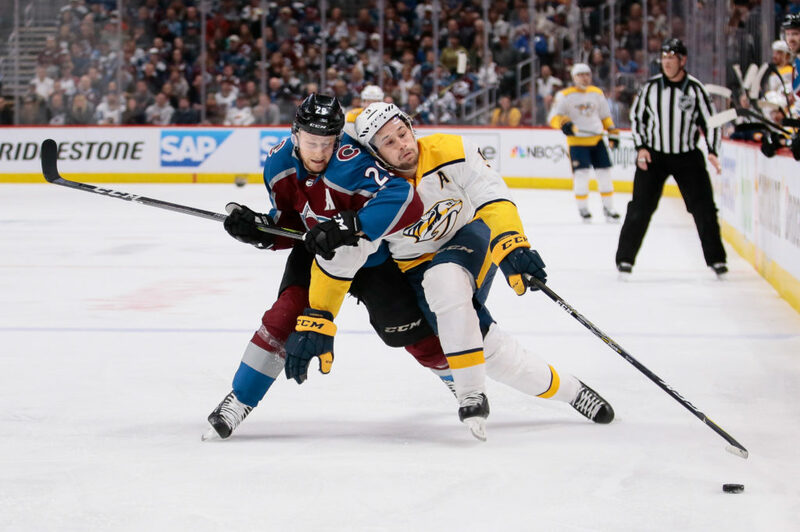 As overmatched as the Avs appeared Sunday night, the thrilling 2-1 Game 5 win in Nashville in the first elimination game Friday night might be more memorable and perhaps even defining. So how should this team be remembered? “To answer that question, there’s got to be an end,” captain Gabe Landeskog told me after the game. “But I just feel like it’s the beginning, to be honest with you. So it’s hard to want to be remembered for something when you’re still growing. This season should be rememered as a hard-fought year and an underdog story, but also as a team that earned everything they got. Even when people didn’t want to give us credit for being where we were, we just kept growing and kept fighting. Nathan MacKinnon ended up with three goals and three assists in the series. He got a nice congratulatory in-passing salute from Predators coach Peter Laviolette — the former Colorado/Denver Rangers defenseman — in the handshake line, and that reflects the major increase in his stature this season. He has gone from No. 1 overall underachiever to bona fide Hart Trophy candidate. And short of eating too many donuts in his annual offseason Tim Hortons commercial shoots with fellow Nova Scotian Sidney Crosby, MacKinnon seems destined to stay among the elite. An aside: Despite, or perhaps because of, the sharp-edged play as P.K. Subban was on the ice much of the time when MacKinnon’s line was out, the Predators’ defenseman after the game endorsed the Avalanche star for the Hart. This comes via Tracey Myers of NHL.com. MacKinnon was the leader in the improvement, no question. Another huge step forward was second-year coach Jared Bednar showing an adept touch that validated Sakic sticking with him after the horrible 2016-17. What can’t happen now is that the Avalanche, from ownership and the front office on down, basks in the deserved praise, gets too cocky about additional incremental progress being inevitable next season for what now is the NHL’s youngest team, and excessively trusts the process. That’s a formula for regression, more so than for rejoining the NHL’s upper tier and threaten to bring Denver its third Stanley Cup celebration. I’m not going to go through an entire rundown here. That’s for another time, perhaps after Joe Sakic meets with the media Monday. 1, When he’s healthy, he’s still pretty good. 2, You can’t count on Number 1 happening often enough. That has to be shored up. The Avalanche needs reliable goaltending, and that’s on all levels, and at least in terms of being available an entire season or close to it, Varlamov isn’t capable of providing it. You can come to that conclusion without trashing the guy. From all indications, he has been dedicated in trying to overcome the groin muscle issues that led to him undergoing two hip surgeries a year ago and his latest mishap — a knee injury — came after a collision. But at some point, you have to concede the data is hard to dispute. He’s out of the lineup too often. He has one season, at year, at $5.5 million (with a $5.9-million cap hit), remaining on his long-term contract. After the game, I asked Varlamov how confident he was that he could return at 100 percent next season. Both Jonathan Bernier and Andrew Hammond — the “Hamburglar” was a nice story while it lasted — playing under expiring contracts and about to become unrestricted free agents, the likelihood of either being brought back seems slim. Yes, Bernier had his streaks — including when Varlamov was out in January — but the ultimate answer was that he’s not going to be the No. 1 goalie, whether by design or default, to take the Avalanche to the next level. The Avalanche lost to the Presidents Trophy winner, the best team in the Western Conference — and a team that a year ago was the No. 8 seed and surprisingly advanced to the Cup Finals. That clearly was part of an upward curve for the Predators organization, and while the situations weren’t completely analogous, the Avalanche is backing on a similar climb..with a slightly different timetable. This set the stage for higher expectations next season. There should be no ovations for one-round and done in the 2019 postseason … if that happens. But, yes, this will go down as one of the more entertaining seasons among the franchise’s stay in Denver. It will become even more noteworthy if it becomes the season that foreshadowed a return to greatness. Terry Frei of the Greeley Tribune writes two commentaries a week for Mile High Sports. He has been named a state’s sports writer of the year seven times, four times in Colorado (including for 2016) and three times in Oregon. He’s the author of seven books, including “Third Down and a War to Go,” about the national champion 1942 Wisconsin Badgers and their wartime heroics, and “’77: Denver, the Broncos, and a Coming of Age.” His web site is terryfrei.com and his additional “On the Colorado Scene” commentaries are at terryfrei/oncolorado. Remember when making the playoffs wasn’t so monumental? How’s this for half full? Is Duncan Siemens becoming more than an “organization” guy?